A storm system approaching from our West will begin to change our weather by Sunday afternoon. This storm system has quite a bit of energy and will bring us good chances for thunderstorms, rain and even snow in some areas along the front range. Euro projected low pressure position by Tues: this is a favorable position for moisture along the front range. Low pressure will move across the great basin and set up over Eastern Colorado. The leading edge of this system begins to move through this afternoon and with it expect thunderstorms across the area. I don’t see much in the way of severe weather but would not be surprised to see small hail with a few of them. 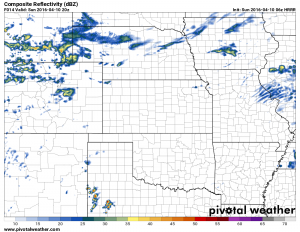 A look at the HRRR model around 2pm shows snow showers beginning in a lot of the mountain areas and thunderstorms forming in advance of a cold front across the plains of Colorado. An interesting thing I saw on a few models is the hint of bigger thunderstorms across Douglas and Elbert counties into the afternoon. 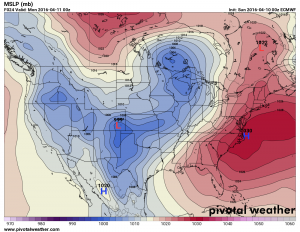 Rain Very Likely… but What About Snow? This system will set up in a favorable position for the front range of Colorado. The low should be just enough South so that we get decent upslope flow. The initial front will cause instability in the atmosphere and thunderstorms will be likely Sunday afternoon. After this initial round, cooler air and upslope flow behind the front will make for rain showers on Monday and possibly into Tuesday. Nam4k QPF forecast. This tells us how much liquid moisture is expected by the time this system moves out. 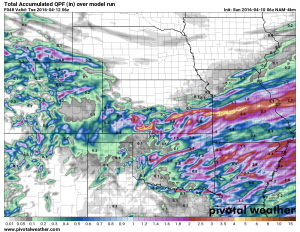 A look at the Nam4k model shows us the possible moisture amounts that could fall. 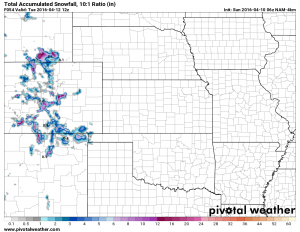 Notice the bias for higher moisture over the Palmer Divide region, most likely due to favorable upslope. Expect the areas in, around and North of Castle Rock to see 0.3 to 0.6 inches of rainfall. Areas to the South of Castle Rock towards Monument and Larkspur will see nearly an inch of moisture. This is one of those storms that could potentially drop a ton of snow along the front range, the good news is that temperatures will remain way too warm at lower elevations to allow for snowfall. Areas South of town with higher elevations will see snowfall accumulate, possibly to the tune of 6-12 inches, so keep that in mind if travelling South on Monday or Tuesday. Clear and warmer, some models have many areas near 80 on Thursday! Models are projecting another storm system moving through beginning on Friday. Thunderstorms Friday may give way to snow showers on Saturday and Sunday. Too early to tell how much snow is possible but keep an eye out for this next weekend.